Thank you for your interest in Electric Masters Service, Inc..
Electric Masters Service, Inc. (hereafter referred to as Electric Masters) is a Woman-Owned electrical contracting business incorporated in the Commonwealth of Virginia and headquartered conveniently in Columbia, Maryland. Electric Masters has Minority Certifications that comply with Local, State and Federal requirements concerning Requests for Proposals (RFP�s). Electric Masters is considered a small business under the federal procurement guidelines. 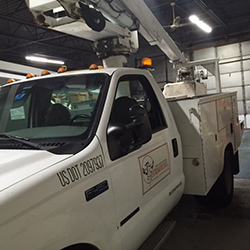 Electric Masters takes pride in maintaining a professional staff of experienced field associates, including Master Electricians, Journeyman Electricians, and Apprentice Electricians. These team members are committed to providing the highest quality service. Electric Masters complies with Federal Regulations, and has the following programs and plans in place: a Health and Safety Program, an Affirmative Action Plan, a Drug & Alcohol Free Work Place Program, and a Quality Assurance Program. Electric Masters encourages, fully supports and is committed to continuous training and education of our Field Associates, and to providing them with the resources to attain new skills and stay current with the ever-changing technology. Electric Masters has a history of Journeymen Electricians obtaining a Master Electrician�s license, which enhances our electrical team. Our Apprentice Electricians are enrolled in a four (4) year educational program and attend evening classes twice weekly during each school year. Electric Masters and its team members look forward to serving our customer's needs. Please call us today! Woman-Owned Electrical Company in Baltimore, Howard, Montgomery County, Prince Georges County, Maryland-DC-Virginia.